Honeymoon Offer – Stay for your honeymoon and save up to 50% off room rate for stays of 5 nights or more. Please contact us for further details. Set foot on Mauritius and you will experience a place so pristinely beautiful and remote that you will feel as though you’ve almost stumbled across a new part of the world. With endless unique selling points to satisfy even the most qualified luxury holidaymaker, this resort features spectacular sunsets, word-class services, a well-appointed spa and signature classes. The superlative resort is located across 20 acres of well-kept gardens on the Baie aux Tortues or Turtle Bay. Guests can forget the world outside as they relax in luxury pavilions with spacious outdoor verandahs overlooking a chic walled garden. The “Touching Senses” programme, includes various expert taught classes for you and your partner to learn and play, such as sculpture classes, wine tasting, painting and stargazing. There is also the option to explore outside the property and visit the capital city of Port Louis and the buzzing small town of Grand Baie. Up to 7 Nights Free – Stay 14 nights and only pay for 7. Stay 6 nights, pay for 3. Stay 8 nights, pay for 4. Stay 10 nights, pay for 5. Stay 12 nights, pay for 6. Honeymoon Offer – Stay for your honeymoon and save up to 50% off room rate for stays of 5 nights or more. Tucked away by verdant indigenous foliage and framed by well-kept tropical garden, the Oberoi’s spa is a tranquil haven. The extensive menu lists a tempting choice of treatments such as Thai, Ayurvedic, Western and Balinese therapies. Yoga, meditation, tai chi and breathing exercises are also available. Fitness – Workout in the bright fitness centre which is well-stocked with a range of cardio and weights machines. Swimming Pool – There are two pools, including a lagoon pool with incredible ocean vistas and a private adults only pool also looking out to sea. Oberoi hotels are internationally acclaimed for quality accommodations, 5 star hospitality and unparalleled views, step inside their Mauritian property and experience honeymoon indulgence at its best. Mauritius enjoys a typically warm climate, ideal for happy couples to make the most of the varied deluxe areas of the resort including welcoming swimming pools, al fresco restaurants and clean beaches. Villas with private swimming pools and two even larger exclusive villas. The four-poster beds and sunken tubs are ideal for romantic rendezvous. 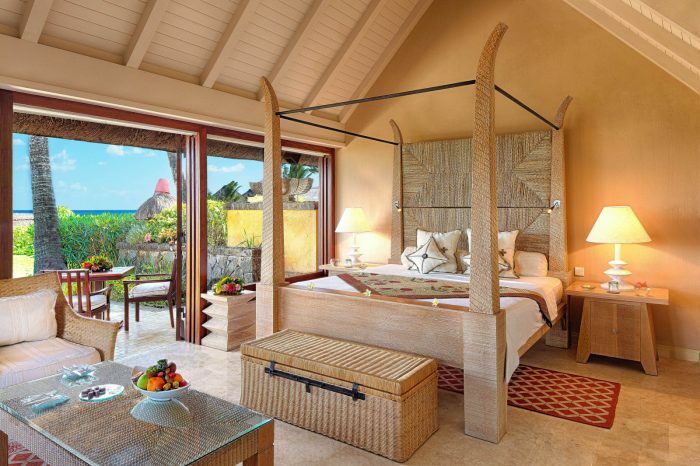 If you select The Oberoi Mauritius, you are in for a real treat as this hotel caters for honeymoon couple’s every desire. The Oberoi never fails to satisfy with its range of fine dining options, ranging from international favourites to local specialties. The Restaurant – The Restaurant features international and Asian cuisine served in a thatched pavilion under the stars. On the Rocks – Perched on top of dark volcanic rocks that spills out into the ocean, this eatery serves wood-fired pizzas, salads, pasta and delicious barbecued food. The Bar – A rustic thatched roof bar where you can catch live jazz and classical musicians every evening. The Gunpowder Room – A recognized national monument dating back to French colonial times, The Gunpowder Room is an intimate yet elegant establishment serving local delicacies and wine.